Today I finally got to planting the peanuts that were given to me. After some reading I have planted them amongst the baby corn that is growing in the back garden bed. I will also try some in large pots to see how they go. Lots of experimenting in this garden. After the frequent rain and also sunshine the soil was just right for planting. Also thriving in this weather is the oca which are in pots. I am near the end of the broad bean harvest so more of the back bed will be opened up to summer plantings. Hooray! 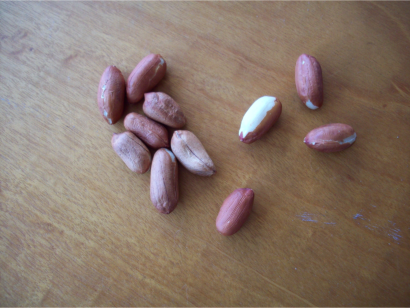 I also read that those peanuts with no skin membrane may not germinate properly. I think that when they expand with moisture the seed has a tendency to split. Those without membranes, or even damaged ones I wrapped in tissue paper and planted anyway to see how they go.